911 Please don't ever forget! We live in an area that is blessed to have manatees. They are slow, sweet, slow, gentle, slow, docile, slow animals. Did I say "slow"? They are huge and live in shallow waters that are shared by fast, dangerous motor boats. 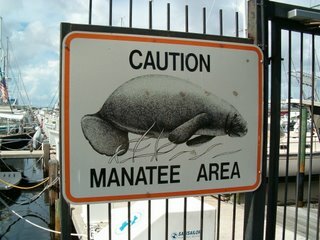 These signs are up to warn boaters that they need to watch out for manatees. Unfortunately manatees are identified in the wild by the shape and size of propeller scars and missing flippers they all have. Manatees are becoming extinct. There are less than 2000 left in the world and most of them live near Florida. Unfortunately they are not on the endangered list anymore, but are listed as threatened which doesn't protect them as well from boaters. For more info about manatees and how to save them from extinction click below.